Lisa lives here 4. Last post. cabinet with one section decorated as a dollhouse bathroom. Lisa and her passion for dollhouses it's a whole chapter of it's own. I´ll have to do another set of post's on that further on. Do you rember this amazing dollhouse site, Puppenhausmuseum. det är så kul att se dina hemma-hos-reportage! I enjoyed this post, such a great home! oooh cant wait to see the dollshouse! 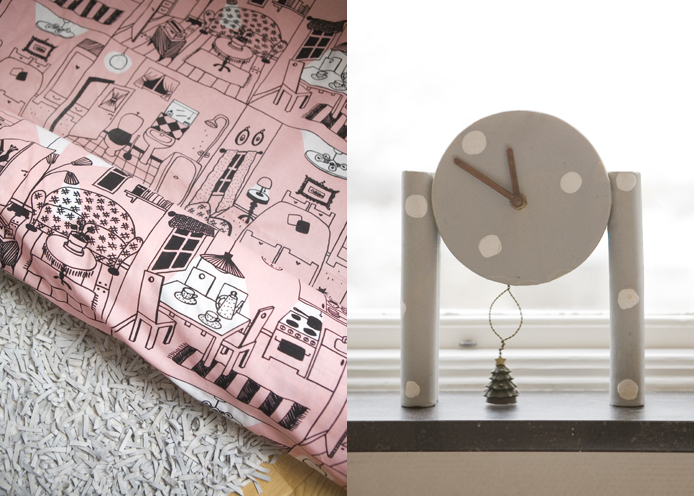 such a great home, such great fabrics and stuff, such great photos! Vad snyggt med ett minibadrum. Jag gillar finurliga detaljer. Sara, Lisa fick det i bröllopspresent för många år sen. Tror att hon sa att givaren köpt det "någonstans i Haga". What a nice series. You should be hired for a house-style-investigator with a camera around your neck. Warm greetings over the sea. :-)) to the last photo. what a beautiful home so full of treasures I am looking forward to future posts on Lisa and her own web site! Wow what a wonderful home! Love everything about it. Tank you four your visit on my blog. Very Swedish and minimal but inspiring. Thank you to both of you for sharing this peaceful happy home. 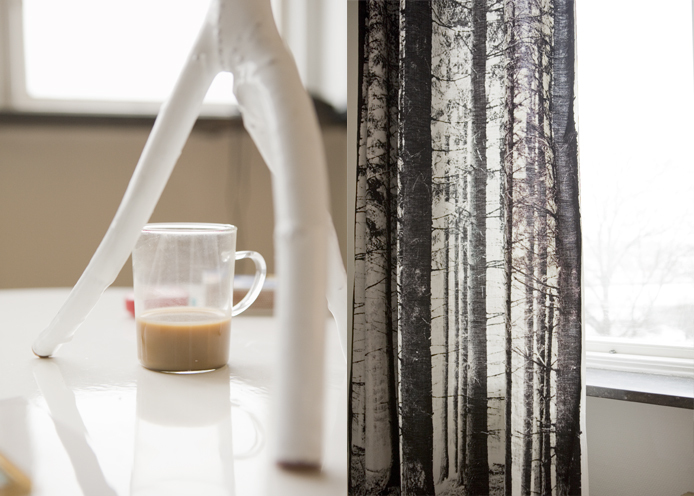 I really really like her birch tree curtains! I want to find them and have them in my home. sa himla smart o fint med dockskåphyllan. . . !! I love the Lisa series. Her house is full of happiness with childhood imagination. I too have a thing for dollhouses. hello elisabeth! only now i realise HOW LONG i haven't been here!! now catching up with all your wonderful posts.. really, i'm BATHING in your photos, and little stories.. it's so soothing and inspiring ahh..
great real-home stories,thank you for showing! and - oh yes, i love it too - "to sneak around in other poeple's homes" with a camera/or without it in hands! ah! the little bathroom is so sweet! you make beautiful pictures. 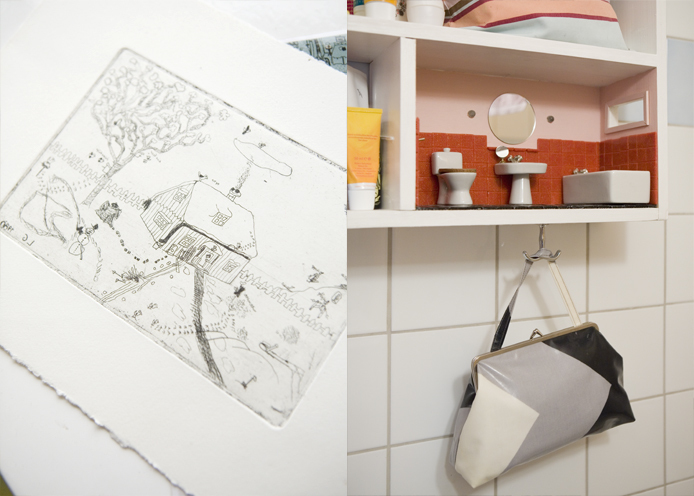 i love the how your posting all these little peeks into peoples home, this house is pure loveliness, i want a tiny bathroom in my bathroom cabinet now! Love - I mean really love - that tree curtain! lisa's pattern is just amazing! awe. so pretty - very inspiring. We- all, will be waiting, when you will put Lisa's web-site!! !